Many healthcare organizations leverage cloud platforms like Microsoft Azure to handle electronic protected health information (ePHI). To ensure the security of this highly critical data, healthcare providers are required to adhere to HIPAA and HITECH. 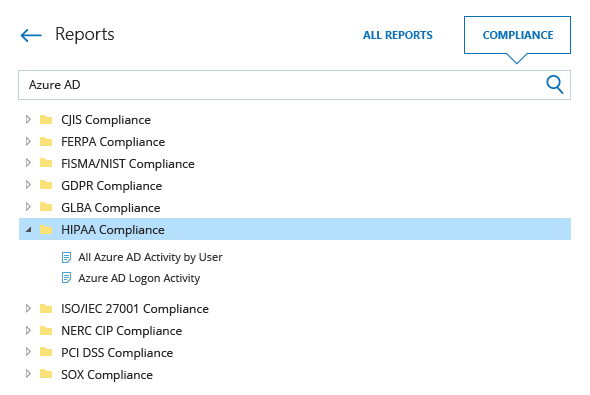 Because the scope of HIPAA and the HITECH Act includes Azure Active Directory, Microsoft provides guidelines for establishing Azure HIPAA compliance. However, this is not enough. You still need to ensure you apply all the necessary security controls across your Azure environment. What do you have to start with to ensure HIPAA compliance? Is your Azure HIPAA compliant? If your organization stores healthcare data and uses the Azure platform to handle it, you can get some peace of mind, because Microsoft will walk you through its HIPAA compliance implementation guidelines in Azure Trust Center. In fact, as a cloud service provider, Microsoft signs a Business Associates Agreement (BAA) with its Azure customers in which it takes responsibility for the security of the underlying platform. But you can’t rely only on Azure Trust Center to ensure the security of Azure Active Directory, which provides roles and controls permissions. While Microsoft is responsible for the outside security of your cloud services, the security of your cloud Azure ecosystem, including Azure AD, rests on your shoulders only. Your Microsoft BAA will not on its own enable you to achieve HIPAA compliance. To implement an effective Windows Azure HIPAA compliance strategy, ensure all necessary internal security controls are in place, and prove that your use of Azure AD aligns with the HIPAA and HITECH Act requirements, you need a reliable solution that simplifies compliance preparation. Slash audit check preparation time by 50% with insightful, pre-built compliance reports mapped to the most common regulatory standards, including HIPAA, CJIS, FERPA, FISMA/NIST, GDPR, GLBA, ISO/IEC 27001, PCI DSS and SOX. Ensure that only eligible users access Azure AD by staying on top of all sign-in attempts, both successful and failed. Identify suspicious configuration or group membership changes faster by subscribing appropriate security staff to the reports they need most, thereby minimizing the risk of system unavailability or privilege abuse. Find answers to auditors’ questions in minutes by quickly drilling down to the root cause of an incident with the Google-like Interactive Search. Prevent security breaches with threshold-based alerts on failed sign-ins or illicit changes to roles. Keep your consolidated Azure AD logs securely for years in the cost-effective two-tiered storage (SQL database + file-based), and easily access them any time auditors knock at your door.